Pulsa aquí para texto en Español Little biography of J.R.R.Tolkien . There go some pictures related to The Lord Of The Rings. Look at them carefully, and if you like them, you can see many more at The Halls Of Tolkien.
" The Balrog reached the bridge. Gandalf stood in the middle of the span, leaning on the staff in his left hand, but in his other hand Glamdring gleamed, cold and white. His enemy halted again, facing him, and the shadow about it reached out like two vast wings. It raised the whip, and the thongs whined and cracked. Fire came from his nostrils. But Gandalf stood firm. " "At that moment there came a roaring and a rushing : a noise of loud waters rolling many stones. Dimly Frodo swa the river below him rise, and down along its course there came a plumed cavalry of waves. 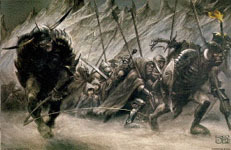 White flames seemed to Frodo to flicker on their crests and he half fancied that he saw amid the water white riders upon white horses with frothing manes. The three Riders that were still in the midst of the Ford were overhelmed : they disappeared, buried suddenly under angry foam. Those that were behind drew back in dismay. " " We are fighting Uruk-hai! We slew the great warrior. We took the prisoners. We are the servants of Saruman the Wise, the White Hand : the Hand that gives us man's-flesh to eat. We came out of Isengard, and led you here, and we shall lead you back by the way we choose. I am Uglúk. I have spoken. " Another good site where you can find ifnormation and pictures, lies at The Hobbit Page . There are all the pictures from the calendars drawn by John Howe, with a great quality; but be aware, because they're also very big. Page about J.R.R. Tolkien, by L.S.Sanz . It has maps, biography, pictures, fonts and more links. In Spanish, sorry. The J.R.R. Tolkien Information Page . Page with hundreds of links about J.R.R Tolkien and Middle Earth; there are many, many ... It pretends to be the Reference Page in Internet. The Electronic Tolkien Encyclopedia Project . That's it : an encyclopedia with all related to Middle Earth. By this time is only that, a project, but it has already some interesting articles. people have visited this page since 1st of September of 1997. Counter generated by http://web.jet.es/~pedroh/counter . This Tolkien and Fantasy WebRing site is owned by greatspawn@hotmail.com. Pablo's Homepage. Please, if you have a minute, take a look at it. I have more to show.